Free-range poultry are often not fenced at all. When they are, the fences need to be distant from the birds. True free-range flocks are generally fed and watered outside. This encourages (in fact, forces) the birds to spend time outdoors and keeps the houses cleaner and drier. If the fences confine the birds to a smaller area than they would normally use, the practice isn’t free-range at all. It’s yarding. Yarding provides an entirely different set of management challenges from free range. Bogus definition #1 calls poultry with any access to the outside “free range,” no matter how small or disgusting their outdoor yard is. A tiny concrete yard the size of a bedsheet for 10,000 chickens counts as “free range” by this definition, which is the one used in the US by the USDA. But let’s recognize that it has the saving grace of being obviously bogus. 2. How do I do Yarding Correctly? Nothing’s wrong with yarding, if you do it right. Most people don’t, though. They haven’t done the arithmetic. It really just comes down to the fact that chickens create a lot of manure: far more than a reasonable-sized chicken yard can accommodate. It all comes down to the amount of manure the land can handle, and the geometry of chicken yards. Up to a certain point, chicken manure is a fertilizer, encouraging plant growth. Beyond that point, it’s a poison, killing the plants. Once the plants are dead, parasites build up in the soil and nutrients from the manure leach into the subsoil or are washed downstream with every rain. So the trick lies in avoiding this overload. In rough figures, a grass sod can metabolize up to four tons of chicken manure per year. 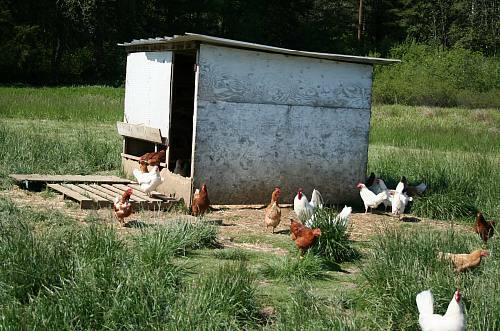 Twenty adult chickens produce about a ton of manure per year. Thus, an acre of grass sod can absorb up to the output of 80 chickens. An acre has 43,560 square feet, so your lovely grass yard needs to be at least 545 square feet per chicken, or a square 23 feet on a side. And that’s just for one chicken! Few people can devote such acreage to a fenced chicken yard. Instead, they use a much smaller yard. The manure load in the small yard kills all the grass, and after that it’s all mud and manure. The reason farmers went to 100% confinement for commercial chicken flocks was that mud yards are unhealthy. But you can dodge the bullets and have a healthy yard with the henyard system. In the Fifties, Geoffrey Sykes pioneered this system in his book, The Henyard, which uses a small yard and large amounts of straw or other absorbent litter to (a) prevent mud and (b) soak up the manure. Once a year or so, the old litter is removed and spread on a garden or a field where the nutrients are needed, and new litter is added. The henyard system (click to enlarge). This is the best and most responsible yarding system. It’s quite simple, too. The only thing that people get wrong is that it takes a lot more litter than they expected. Once you realize this, it’s clear sledding. Mud appears in the yard? Add a lot more straw. The straw is getting nasty? Add a lot more straw. When you do it right, the hens enjoy an active outdoor lifestyle, but their feet don’t get muddy, the eggs are clean, and you don’t start losing hens to parasites after 2-3 years, the way you do with mud yards. Sykes recommended smaller yards, just 5-7 square feet per hen, with 2 square feet per hen indoors. His system used about a ton of straw per year per 50 hens. Chickens like shade in warm weather and like to be out of the wind in cold weather, so Sykes recommended a windbreak all around the yard: a board fence, straw bales, whatever. This encourages the chickens to spend more time outdoors. 3. How Can I do Free Range Appropriately? We’ve already established that 80 hens per acre is about the limit of a well-established grass sod. But you need a safety margin, so let’s settle on 50 hens per acre as the the upper limit. Maybe quite a bit less, depending on your soil and management. Otherwise, you’ll kill off the grass and pollute the area with runoff, and end up with “mud-yard free range” that harbors little but parasites. Fifty hens per acre is about 800 square feet per hen. Hens also don’t like to travel long distances. They’ll spend most of their time within 50 yards of the henhouses. Hens travel between henhouse, feed, and water, so you can spread them out by feeding and watering them outdoors, with the feeders, waterers, and houses at some distance from each other. Hens scratch the ground with their feet, eventually destroying any plants near their houses. Most of the manure is inevitably dropped near the houses as well. Evening out the manure load and giving the turf a chance to recover pretty much requires that you use portable chicken houses. Predators are the biggest threat to your chickens. It is much easier to protect chickens kept in confinement or in small, tightly fenced yards. See my Simple Electric Fences for Chickens FAQ to learn how to keep your flock safe. On the other hand, disease, parasites, and cannibalism are much less troublesome on free range. Free range is pretty much synonymous with portable houses. I use small portable hen houses, which I move with a tractor once the ground around the houses becomes muddy. This is the traditional approach. Area around the pasture coop is bare, grass right nearby is overgrown. Time to mow the grass and move the coop! Other people are experimenting with larger houses, typically greenhouse structures build on skids. This is okay, too, though I’d stake down such lightweight houses very firmly if I were you. At the moment the trend tends towards tight confinement within electric poultry netting combined with very frequent house moves (every 1-3 days). I predict that this will slowly evolve into the use of a much larger perimeter fence and less frequent house moves. The labor savings are greater this way, but you have to be willing to let the grass under the house die from being scratched to pieces by the hens. With low stocking density, a few bare patches here and there make little difference. By using outdoor feeding and moving the feeders around every time they go empty, you can shift the chickens’ traffic patterns somewhat, forcing them to use the pasture more evenly. See my Range Poultry Housing page for more information. Real free-range egg farming is much more labor-intensive than confinement or mud-yard free range, so it’s not worth doing commercially unless you can get high prices. One reason you can get away with infrequent house moves is that the manure in a litterless chicken house becomes drier and less obnoxious the longer the house sits in one place. I’m not exactly sure why this is, but it’s true. The first few days a house is in a new spot, the manure on the floor is wet and nasty. If the house has been in one place for a month, the manure is quite dry and there is no smell. Moving the houses too frequently maximizes the wetness and smell. On clay soil, the mud problem makes it important to keep a solid turf at all times. Permanent pasture is the simplest way of achieving this, though a crop rotation with grasses or clover as one phase will also work. On sandy or gravely soils, cultivating the soil does not lead to an instant mud problem, so keeping the chickens among growing crops is a viable alternative. Chickens love shade. It keeps them cool, out of the wind, and protects them from hawks and owls. Corn, kale, and sunflowers, planted with wide spacing between the rows and often with a ground cover of grass or clover in addition, are traditional chicken crops. When the crops ripen, the plants are knocked over and the chickens thresh out the grain or eat the leaves themselves. The chickens must be kept off the crop fields when the crops are young, but once the crops are big enough to withstand scratching, the chickens can be turned loose among them. This is the method preferred by Milo Hastings in The Dollar Hen. Hedges and structures like board fences can also provide the shade and windbreaks that will help the chickens to spend most of the day outdoors. Careful placement of feeders and waterers to encourage ranging is also useful. 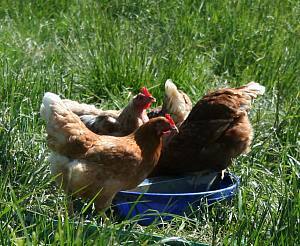 This can be overdone—in really hot, sunny weather, the chickens may prefer being thirsty to covering a long distance in the hot sun, sometimes with disastrous results. At the very least, the chickens shouldn’t be forced to go indoors for feed and water. Feeders and waterers should be scattered at convenient intervals across the range. Running hens among trees is also a possibility. Hens will roost in the trees, which is a nuisance and causes the egg yield to fall precipitously in bad weather, since food energy must be diverted to keeping warm. This is not a problem with modern broilers, which do not fly. The appropriateness of running chickens among fruit trees depends on the type of fruit. Tree crops that are allowed to fall to the ground before being gathered are a bad choice unless having your chickens eat them is part of your plan. In many countries, paranoia about bacteria levels will prevent you from running poultry among the trees. Eggs from chickens who spend a lot of time outdoors and eat plenty of fresh green plants taste better and have darker yolks than those of confinement hens, and the meat is also more flavorful and better-textured. This superiority forms a solid basis for attracting quality-oriented customers who are willing to pay premium prices for premium products. Range can also reduce feed consumption somewhat and allows a simplified diet, though less than people often suppose. Click here for an old-time description of this. 4. How Can I Make Money From Free-Range Eggs? I don’t know any free-range egg millionaires, but the business can be moderately profitable if you’re careful. Ninety years ago, a flock of 2,000 free-range hens was considered a manageable size for a farm where eggs were the primary product (that is, where the other crops grown were incidental and mostly fed to the chickens); flocks up to around 1,000 hens were kept on diversified farms. Such farmers simply collected the eggs and delivered them as-is to wholesalers. Washing and grading eggs, delivering them to stores, and selling them at farmers’ markets can easily take more than half the total time involved with the egg business, meaning that your flock has to be smaller. In the pastured broiler business, it is much the same. Butchering, packaging, and delivering the broilers is usually more time-consuming than raising them. To keep an operation profitable, it’s very important to recognize that you can’t participate in the commodity market. Your costs are far higher than a commodity egg farmer’s. (You’ll find some armchair experts who’ll deny this, but not any actual farmers.) This means producing the best product you possibly can and marketing it to the most discriminating consumers you can find, at the highest prices you can get. It’s essential to receive high prices, or you will go broke. For more about free range stocking density, see How Many Chickens Per Acre? More details on how free-range hens are raised on my farm can be seen in my free-range presentation. For a much more far-reaching treatment of free-range egg farming, you should buy a copy of The Dollar Hen, which I have republished under my Norton Creek Press label. Admittedly, it was written over 100 years ago, but I still learn something new every time I open that book. Additional information about both yarding and free range can be found in James Dryden’s classic Poultry Breeding and Management, which I have also republished. If you are interested in free-range or pastured broilers, you need to buy a copy of Joel Salatin’s Pastured Poultry Profits. There are just two of us. When I started keeping chickens we had a daughter as well, she has since married and left. We kept 12 chickens which was way too many. The raccoons and Hawks gradually pruned them down to 6. I put up a fence about 10′ by 40′ and covered it with mesh. That kept out the Hawks. We still had way more eggs than we could use which meant we were giving eggs away, a lot of eggs. Then a raccoon(s) got in and killed them all. So we got three chickens figuring that would give us 2 eggs a day, about right for two people. And we attached a dog run to their house. The house is 8×8 and the run is 5×10 and 6 feet high, which is nice for us! The 10×40 run had been about 3 1/2 feet high – hard to manover in for an old man! Three is about right. It gives us about two eggs a day and we can stretch the feed bill by feeding them our kitchen scraps as well as weeds and grass when I mow. I let them out sometimes an hour or so before bedtime, so they don’t stray too far.